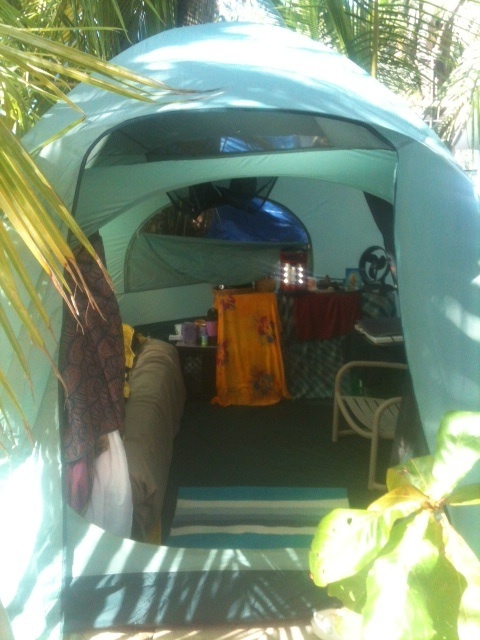 One month here in the Bahamas living in a tent in order to daily meditate, chant, practicing yoga asana and karma yoga. These are all things that living in New York City I did not find the time to do daily--and I craved to do so. What does it mean to be "on" time? Sitting at Starbuck's this morning is in the past. Now in my tent is the present. Tonight listening to Krishna Das's last concert here, is in the future. Didn't I just move through three different dimensions of time as I typed those sentences? I felt the cushion of the the round rattan chair under my legs, smelled tonight's dinner cooking in the kitchen not far from my tent, and heard the sound of Krishna Das's voice "Hari Krishna". What can meditation teach about time? These experiences teach me how to be me newly in each moment. Past time falls away. Future time does not exist. Now is all there Is. Sometimes in that Now I am lifted up and out into an experience of something beyond myself, yet completely a part of, my Self. Eternal. Ever lasting. Presence. At brunch just Now in a conversation with another New Yorker a realization came. One of the things being looked at through my experiences here at the Ashram is a comparison of sitting in silence and stillness and entering into timelessness, and singing kirtan or raaga which, as is the nature of music, is a movement through time, neither silent nor still. A routine has developed. Every day that the weather and temperature permit, I go to the beach after I finish work in the Boutique. I usually lie on the sand where the sun is still shining, moving a few times as the shadows from the palm trees fall longer and longer onto the beach. If it is warm enough I take a dip in the sea wearing goggles to see the light patterning on the sandy bottom. When I was first assigned to the Boutique and realized the hours would prevent me from the best hours for sunning, I was not so happy. Now as the routine has entered my life, I enjoy the gentle rays of the late afternoon hours to sun and to swim. Shiva Pose with Ashram Priest in background (L) and photo of Swami Vishnu-Devananda (R), who was sent to the West by Swami Sivananda to established Sivananda Vedanta Yoga Ashrams around the world. I will be making coconut macaroons with chocolate chips as an offering. We will stay up all night in the Temple and then feast the next day. 21 February 2012 Yogis harness the power of Now. I have a new respect for cookie chefs and makers of macaroons. It is quite a sticky mess to roll the coconut batter into balls. After baking the spheres of coconut longer than the recipe suggested, and having added chocolate chips and a bit of orange peel, I thought that they would not hold together. It was suggested that we meditate on our mantra while preparing the prasod. 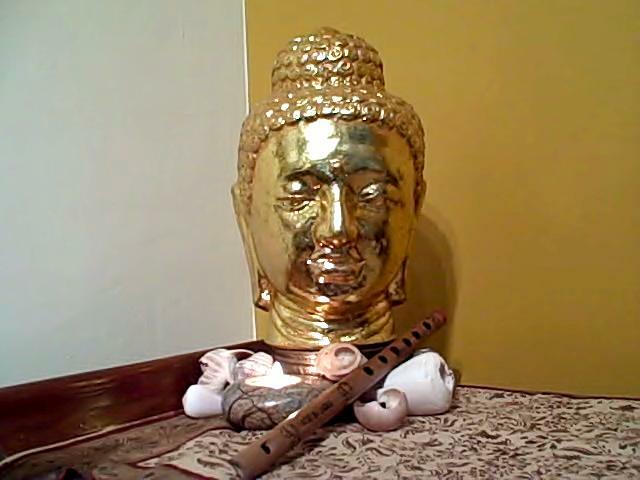 I sang OM, sometimes just humming the notes G to C the whole time I was preparing the offering. This morning at 6 AM when the macaroons were displayed with the rest of the prasod, they had all firmed up nicely. Tasty too. Maybe it was the Grace of the Guru and all of the blessings they had during the all night vigil? Maha Sivaratri is a feast of the senses: sound, sight, smell, taste and are all meant to delight. And ritualized actions bring concepts manifest. The continual chanting kept the mind from reaching out beyond what is happening at the moment and brought expanded breath into the body. Yogis are in the Now. Each day via email I receive a thought for the day. Another heart connection. We often hum and sing to ourselves because it makes us feel content. It is the melody itself that makes us feel good - words and thoughts do not matter. Having hope for ourselves and for our universe is like having a melody always moving inside us. The melody may be calm or exciting, but most of all it brings with it beauty and a sense of peace. Hope can overcome the need for words and thoughts and promises. Hope is the melody that keeps us going, the hum that continues even when there are no words to the song. Hope is not a melody we think about - it must come when we believe in the goodness of our world. As I live here in this Yoga Retreat Center/Ashram my mind will have the opportunity to keep adding, retracting, reviewing, accepting and revising "What makes a yogi, a yogi" in a series of impressions expressed through essay, video, photography, questions and stories. 16 February 2012 A yogi is someone who lives a yoga lifestyle. What is that you ask? A certain attitude. Many in the West think of exercise and strange postures when they think of yoga. A few understand that it is also about the mind, through different approaches to meditation. Some know that along with daily meditation, there is also prayer often in the form of chanting, or what is called "kirtan".Very few know that it is a complete system of living. 17 February 2012 Music can be a yogic practice. There is an Classical Indian music festival at the center right now. There was an exquisite concert by G. S. Sachdev, a master on the Bansuri flute. During the one hour first number (one hour of continuous bliss!) I dipped into a gentle meditative state. The approach was slow in the same way that I enter the Caribbean sea here. I felt the energy open and flow in three different chakras (energy centers in the body): the 2nd chakra, the heart chakra and the chakra that is called the Third Eye. Transcendance is what makes a yogi, a yogi. 18 February 2012 Yogis live in the spaces among heart connections. Sachdev and I met right after he first arrived. When he found out that I was a singer who was interested in Indian Classical Music, he told me about the classical Hindustani vocalist, Sanhita Nandi, who was to be coming soon. I told him though I had worked with one teacher, I was not available to work one on one with her. Sachdev offered to contact Sanhita and to introduce us. Sanhita and I connected in the space of a beautiful lesson last night. We met. We sang. I learned much. Magical connections, from one heart to another, make a yogi, a yogi. I am now officially a tent dweller. Think nomads in one of those movies in Mongolia or another desert, only see the Caribbean. The Caribbean as inhabited mainly by yogis. Check back later for the blog in "What makes a yogi a yogi?" 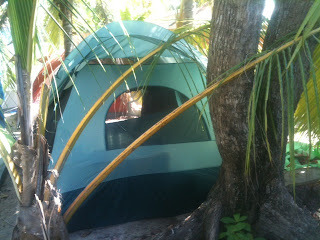 The tent I bought is excellent--as is the tent real estate that I was able to procure. 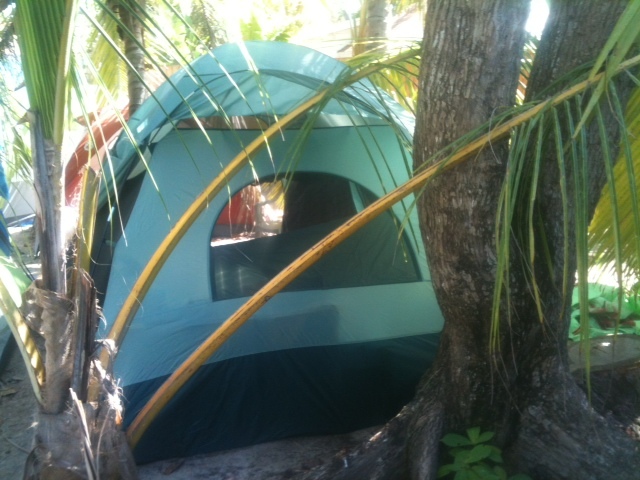 I am listening to the sound of the waves rolling into the shore and the wind rustling the leaves in the large palm trees that surround my tent. The wind in leaves sounds like rain. I have not had my first "rain storm while sleeping in a tent" experience. Had a conflict with a woman in the office who has just returned to her Karma Yoga position. I started working in the Boutique office while she was away so we had not met. At first we got along. Then we didn't. Then there was a minor eruption. Then she did not want to discuss the issue she had raised. So I backed up. I offered to transfer to another job. Or speak to the woman who manages us. I found it interesting that this woman said she needed space. On several occasion when I mentioned an action I had taken here, she commented on the the way the Swami would react. In what I have noticed there is not any set response for actions. It all depends on context. The office is a very small space. Way too small for four Pitta dominant women to be working! I did not speak to the "boss". She actually gave me jobs to do in the Boutique and in the craft shed, which kept me out of the office--and out of the line of firing darts from the returning woman. I confided much to much to her. Another lesson. I too quickly confide with others whom I have just met. Discretion is a virtue. Insight: I need to make sure that I am giving myself enough space. Sometimes that means asking for it. We cannot give freely to others what we do not give to ourselves. If I am giving myself enough space then possibly my energy which I know is very strong and often very large, may have enough room so that I am aware of others and their needs in a new way. Insight: men are needed to keep the women around from pick pick pickin on each other. There is a chicken that lives here called "Crazy Chicken". H/she seems to be always in complaint about something. Actually I think it is a rooster. You figure out how that connects to my story! 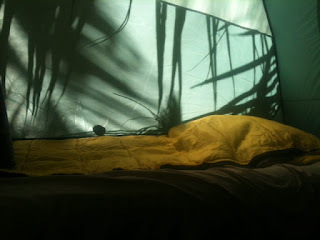 Been in my tent for two days, doente com grippe as they say in Brasil. Began as irritation, then frontal sinus pain then bloody mucous (sorry, yogis are very interested and graphic in the comings and goings of all things with the body). Next the intestinal stuff began--it's like a full out evacuation! Low back pain. Told the head Swami since it is required of Karma Yogis to go to both morning and evening satsang and I had missed both last night and this morning. Attendance is taken! He wants me to see the staff doctor. I spoke with him by phone and we will meet tonight to discuss my doente com grippe. These symptoms are not uncommon for me: sinus and intestinal distress concurrently. Why now, in this beautiful place with healthy food, clean water and great air? Anger is my guess. Anger that I have become aware of and begun to release and transform into compassion. This stuff goes way, way back, in this life, before this life I believe. February 1, 2012 5:15 AM--I awake. As I walk in the dark on the path to the bathrooms, my consciousness is somewhere between Delta and Theta. I spontaneously create my day by auto suggestion to have a day of joy and compassion. I imagine greeting and meeting the new people that the day holds for me, and to serve with a gentle presence. I think how every day we are serving others, whether we realize it or not. Today is to be my first day as a Karma Yogi. Morning Satsang is lightly attended as most of the Yoga Teacher Training students have departed since graduation yesterday. I sit near the West entrance against the wall to have something to lean on in case I needed the support during the meditation. There is a clear sight line to the altar filled with icons of Hindu deities and photos of Sivananda and Vishnudevananda. The lecture is on Vedic Astrology also called Joytish. At the end of satsang, there is a reminder by the Swami who is the manager of the ashram and retreat center that there will be a staff meeting (as every morning) in 5 minutes. At the meeting I sit up front. The Swami smiles at me, saying good morning and asking me my name quietly. At the beginning I am introduced as a new karma yogi and all applauded to welcome me. He privately asks me to stay behind. I patiently wait at the end of the meeting for his eyes to meet mine and am told to set up an appointment with Nairani. I replied that I already had an appointment scheduled. He questions as to when, and then smiles. I smile my goodbye, and without thinking about it, bring my hands to my heart in a prayer pose and gently bow my head. He returns the gesture. It turns out I did not start my karma yoga today. Since I could not move into my new tent home until the space was free on February 3rd, it was decided that I wait until then. So I have two more days of yoga vacation to hang out on the beach and converse with my roommates: a 17 year old young woman and her mom who is taking the Advanced Teacher Training Course. They are from the South and we connected immediately over many things. I even gave the daughter her very first voice lesson while they were her. She has some talent! Another day of vacation with beach sunning time and conversation. Feeling very tired, I skip the evening satsang. I had the 4 bed dorm room to myself. Ah. I do like empty space and silence. Will be very interesting to see how this only child fairs living in a tent in a community of 100 other people and learning to serve others as well as take care of myself … I skipped the 6 AM morning satsang, catching up on much needed sleep and resting in the morning. In preparation to move into my tent I leave satsang during the lecture and check in with the current occupants of what is to be my new real estate. This is also my first day of Karma Yoga. I go to the reception area and let them know that I have not studied the brochure and web site and do not feel sufficiently ready to answer the phones. I am told that someone else will be consulted to decide what my "karma" ie job, will be. I meander about until I see the Swami who is to decide my fate. He calls me over and explains I will be in the Boutique and he takes me to meet my new supervisor, one of the senior woman teachers at the Ashram. It is decided that I will be working in the back office, being trained to create purchase orders and receive supplies for the Boutique. I am learning how to use Quickbooks as part of working with the inventory. My accountant told me to learn to use quickbooks. Funny how things happen. The days are long as a Karma Yogi. February 4 2012 10 PM I am in my tent and ready for bed. Sometime earlier in the night I awoke with a great need to pee! Being reminded in the satsang lecture about hydration, I took the message and drank a litre of water during the satsang. [When I first arrived, within a day or two I had a consultation with the on staff ayurvedic counselor. We had discussed many things about past present and future related to myself, my birth family and the new Sivananda family with whom I have chosen to become a part.] I realized while getting dressed that I had left my yoga mat in my yoga bag outside by a tree yesterday. Still dark, I went to look for it and it was not where I left it. I became full of anxiety, questioning why it had been moved. Was it stolen? Put away in a safe place? I spoke with another Karma Yogi who was getting up in the dark. She gave me suggestions of what to do. I did those things and a few more and as of now the mat and bag are still missing. Eventually, I let go of the attachment to getting the bag back. An hour later the mystery was revealed through some information offered from someone at Brunch when I announced that I was looking for the bag. Within the next 15 minutes, on the way to my karma in the Boutique back office, I find out who has the bag and get it back.